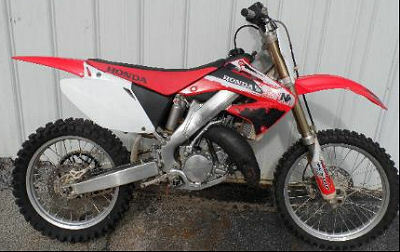 The 2004 Honda CR 125R for sale is a stock dirt bike with low, low hours. The forks have new seals (the motorcycle didn't actually need them but I thought it was time for replacements), the tires are in very good condition, the chain and sprockets are in very good condition, it has a new twin air filter, it has had a fresh oil change and the suspension has been set up for a 180 lb rider. This nimble little motorcycle has a ton of potential; the quality of this dirt bike is second to none! Not only is the 125 a blast to drive; they’re a breeze to own and operate. among the easiest bikes to work on and maintain. Offroad and trail riding enthusiasts that value handling above all else should look no further for a great bike that is ready for the next owner to ride! If you have any questions regarding the 125cc trail bike or if you would like to make an appointment to see it in person or make payment and pick up you can call me at the number listed below (and don't forget to mention that you found my ad on GoGoCycles Used Motorcycles for Sale ) and I will be happy to provide answers to your questions or set up an appointment as quickly as possible. In my opinion there is not a better deal on a used dirt bike for sale as this one in Richmond VA Virginia, on Craigslist or Ebay! GoGoCycles would also like to encourage our biker friends to write a review of the 2004 Honda CR 125R for Sale or share any thoughts and/or opinions to make potential buyers aware of any problems that are commonly associated with this brand or to highlight its positive features and help our visitors make informed decisions. My asking price is only $2695.00 OBO which is a very good price for an off-road bike of this quality so call me or text me (NO EMAILS) at 804-five-three-six-7five three 4 before it's gone and don't forget to mention that you found this ad on GoGocycles Motorcycle Classifieds www.gogocycles.com using the comments forms located on this page.